ALAMO — Police here made another arrest Wednesday evening in an ongoing investigation into an alleged security leak that put sensitive narcotics information into the hands of local drug dealers. 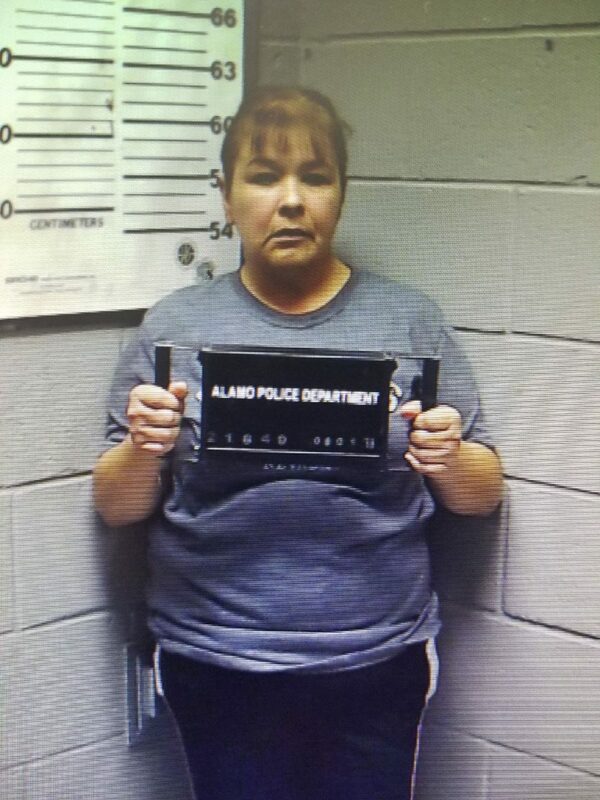 Janine Lynn Garza, 54, was arrested on a tampering with physical evidence charge, according to Alamo Police Chief Baudelio Castillo. Garza is the mother of the city’s executive secretary, Crystal Denise Garza, who was arrested last week on an engaging in organized criminal activity charge. Castillo said the city employee allegedly leaked police department narcotics information to area drug dealers. Municipal Court Judge Celia Garcia set Garza’s bond on the third-degree tampering charge at $40,000 during her arraignment Thursday. Janine Garza, 54, is arraigned on a tampering with physical evidence charge by Alamo Municipal Court Judge Celia Garcia on Thursday, Aug. 2, 2018, in Alamo. The police chief said the elder Garza tried to conceal her daughter’s cellphone from authorities during the investigation, an allegation that mirrors that made by the chief following the July 27 arrest of the executive secretary’s boyfriend, Eddie Ramirez, on the same tampering charge. Castillo said the elder Garza also made a false statement to police. Police became aware of the leak in early summer, the chief said, and traced it to the executive secretary, who they accuse of sharing police targets with local drug dealers, in addition to the identities of undercover narcotics officers. “She was being used as the middle person to set up the buys with the actual bigger players for the smaller drug dealers,” Castillo said, adding that his department’s investigation “placed her at different residences that we’ve been investigating” as drug stash houses. As a result of the leak, the chief said his officers weren’t finding the amount of drugs they were looking for during raids and that suspects were leaving residences in advance of a raid. “When there’s crucial information being leaked out from our own employees, that becomes a hazard and a crucial item that we need to investigate,” Castillo said. Alamo Mayor Diana Martinez said she had “no comment” Thursday about the investigation and declined to answer questions. City Manager Luciano Ozuna Jr., who was Garza’s supervisor, also declined to comment, although he noted that she has been suspended without pay since her July 26 arrest. He said his officers are working with the U.S. Marshals Service to make several more arrests in the case. If convicted of the third degree felony charges, Crystal and Janine Garza and Ramirez could face up to 10 years in prison if convicted.